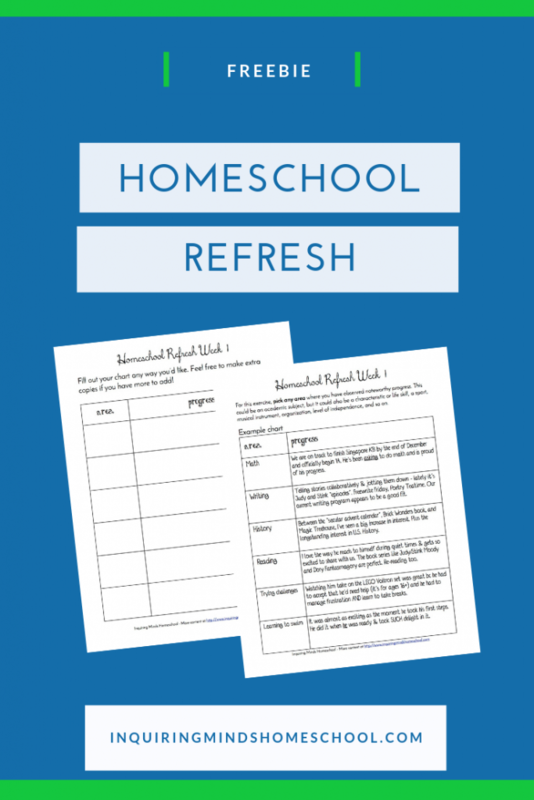 Welcome to the first post in the Homeschooling Preschool series! 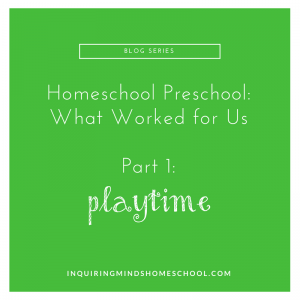 This post will talk about playtime – why it’s so valuable and what our top favorites are! Stay tuned for our other posts about early reading, math, science, social studies, music, foreign language, art, and sensory activities! Homeschooling preschool can seem complicated, but it really isn’t. Most parents agree that 3-4 is too young to be “pushing” academics, but they feel like they should be doing something. Advice like “Just let them play!” doesn’t really provide a picture of what that looks like in practice. 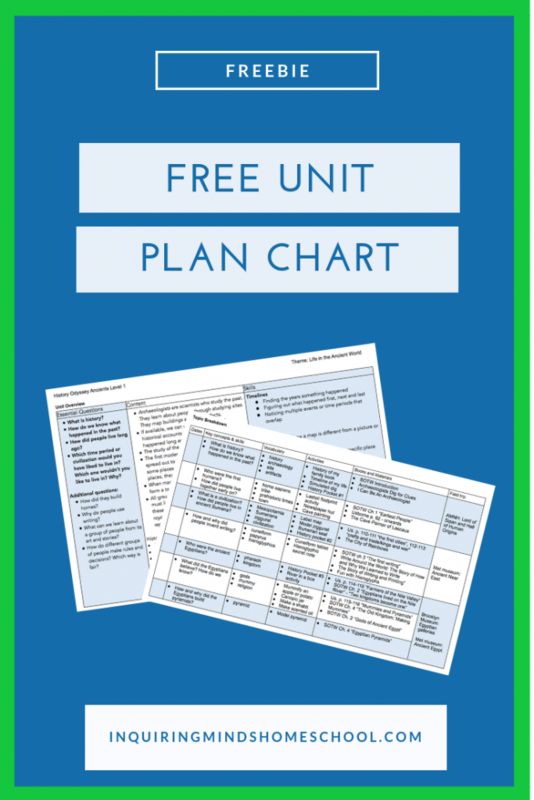 My son is turning 5 in a few weeks, so this seems like a good time to review what we have been using for homeschooling over the past few years. What has been successful during his preschool years? My homeschooling style has been to go with what he’s interested in, gently nudging him in a direction if I think he’s ready, but not pushing. I plan to continue that for the upcoming year – he’s still quite young! Most of his learning should still be through play. Many of my recommended resources are used with a light touch, at his request. So, in case you’re wondering about homeschooling preschool, read on! Disclaimer: As an Amazon Associate, I earn a small commission from qualifying purchases at no cost to you. Thanks for supporting this site! There’s mounting evidence that children must play – if they are denied the opportunity to play, their development suffers. (More about the importance of playtime here. )What that looks like will be slightly different for each preschooler, since some children love getting messy, others love running around being active, and still others love sitting and pouring pretend tea. The suggestions I’m going to give are ones that we personally used and loved! 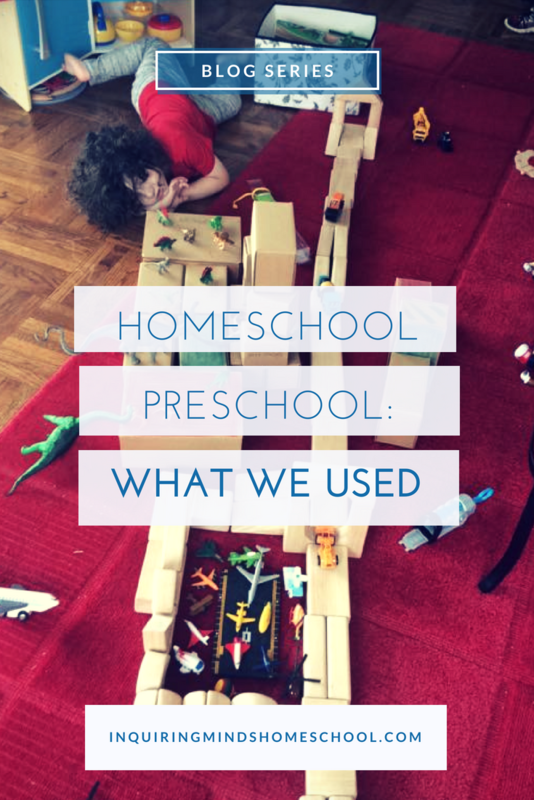 Since I was an early childhood educator before I became a homeschooler, my choices are also informed by all the preschoolers I’ve known over the years and what they liked, as well. I included both Legos and Duplos on our list of faves. Why? My son loves both! Although he’s gotten very proficient at putting Legos together, he still plays with his Duplos regularly. More as pretend play, with characters, rather than for building purposes. Duplos come in sets that emphasize characters interacting in community settings, as is appropriate for a preschool child. My son’s favorites are the pizza restaurant, airport, and rocketship! My son loves going to the Lego website (with me doing the clicking) to find building instructions. If we don’t have the particular color pieces shown, he substitutes – what an eureka moment when he realized he could do that! He’s even started to play with combining several smaller pieces when he doesn’t have a suitably sized big piece. This may become a math focus later on, but for now he’s exploring it on his own! Pretend play is also super important for kids this age. My son loves his play kitchen, which we sometimes turn into a play marketplace with his toy cash register (more on the cash register when we talk about math!) He also loves being Doctor, working with toy tools in his construction gear, and saving the day as a fire fighter. I also want to give a shout out to Wonder Crew, which makes awesome dolls! My son’s first doll was a cute baby, but he really resonated with his Wonder Crew doll – especially since it came with a matching outfit for him! I’m a firm believer in dolls for ALL kids. In the next post in this series, I’ll talk about our favorite toys and materials for sensory play! Stay tuned!